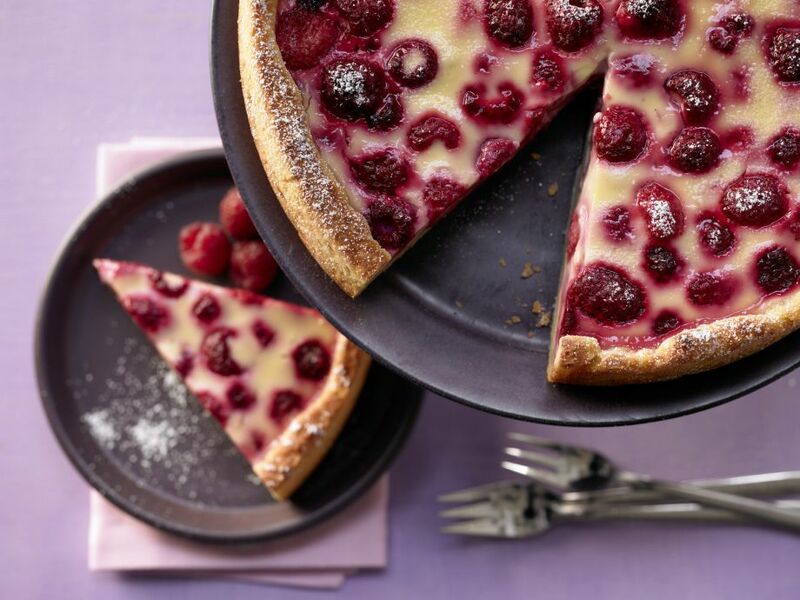 Raspberry Cheesecake - Impossible to resist when you are in the mood for raspberries! 1 Rinse lemon in hot water, wipe dry and finely grate zest. Mix together flour, baking powder, 50 grams (approximately 3 tablespoons) sugar, 1 pinch of salt and the lemon zest in a bowl. 2 Add 5 tablespoons milk, the oil and quark and beat with a hand mixer until smooth. 3 Turn out dough onto a floured surface, roll out to about 28 cm (approximately 11 inches) in diameter. Coat a springform pan (24 cm or approximately 10 inches in diameter) with oil if necessary, then dust with flour and tap out excess. Press dough into bottom and 2 cm (approximately 3/4 inch) up side of pan. 4 Mix frozen raspberries and cornstarch in a small bowl and arrange on top of the dough. 5 Mix together sour cream, remaining sugar, eggs and milk in a bowl and pour over the berries. Bake on second rack from bottom of preheated oven at 180°C (fan not recommended, gas: mark 2-3) (approximately 350°F) for 30 minutes. Reduce oven temperature to 150°C (gas: mark 1-2) (approximately 300°F) and bake until filling is set in the middle, 25-30 minutes more. Let cool, dust with powdered sugar and serve.